These urban shots are repeatedly reminding me of Chicken Soup , maybe because of the way the stories are compiled loosely held together by a common theme. 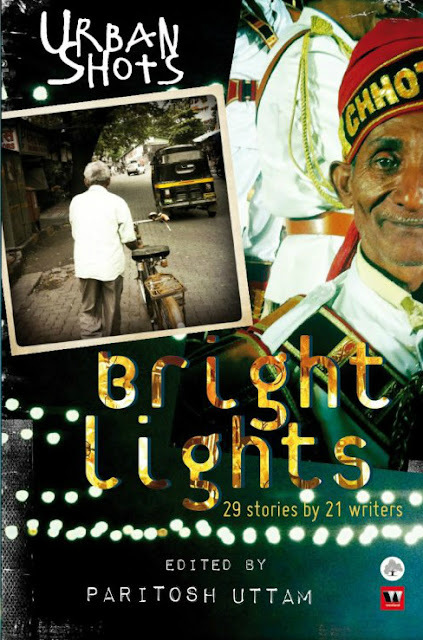 This one edited by Paritosh Uttam is a good read but some stories don't really hold my interest and grammar nazi in me raised an eyebrow more than once while reading this book but I'll ignore that because some of the stories were really nice and heart warming . 29 stories by 21 authors , there is no clear theme as such but I think this gives a platform to some really upcoming writers that could do with some recognition . Life and memoirs of Urban India through these great writers coming from varied walks of life. One can connect with the stories and the writers vary from students to young couples and so the concept and content is new and fresh. I have a lot of favourites such as "Father of My Son" by Roshan Radhakrishnan , a story about a young couple and their 7 year old son who wants to marry his classmate. Its so cutely written , the comic timing and the lovey dovey parts between the couple is EPICLY BRILLIANT, reading the whole book was worth it because of this story . It will surely leave you with a big smile on your face.
" Amul " by Arvind Chandrasekhar is also a brilliant narration about the ordeals of a young child , who innocently doesn't realise the gravity of his sorrows or the reasons for emptiness in his life. Innocent and heartwarming. " Paisely Painted Memories" by Sneh Thakur also was a beautiful story intertwined betweent the past and the present . The narration in this story is brilliant . "Mr Perierra" by Ahmed Faiyaz also touched my heart , we all have that one person who influences our life in little ways , a teacher , elder or just a friend . Its about a boy and his old neighbour , who is suffering from cancer . A lovely story. "Silk" by Salil Chaturvedi is also a well written story about infidelity and why people cheat , the feeling of being loved is put in words. Its beautiful. "Across the Seas " again by Ahmed Faiyaz is about the distance that seperates a son from his parents and the emotional turmoil they feel without him around , while he lives upto their dreams and aspirations and how one letter from him makes his mother happy for weeks . I also liked "The Pig in A Poke" by Mydhili Varma gives a hilarious twist to cyber crime , it uses letters to tell a story . I love narration via letters maybe one of the reasons why I liked it alot. "Maami Menace" by Pradeep Raj and "Double Mixed" by Namita Nair and "Window Seat" by Salil Chaturvedi also were very good and hit a cord. This review is a part of the Book Reviews Program by Blog Adda. Participate now to get free books! damn..all you lovely people in blogger are talking about this book :O I really gotta nail it now! Will look for! :) Thank you for sharing!